For many young recruits, the military offers a sense of protection and family that they never experienced at home. Whether escaping an abusive upbringing or life on the street, many soldiers find their first support system in a Battle Buddy – a partner that you’re assigned upon entry into service. Once discharged, stability can be difficult to maintain without the camaraderie and care offered by a fellow brother or sister in arms. Some veterans in crisis turn to suicide. A year after joining the Army in 1985, Edwin received an honorable medical discharge after a fall rendered him unable to continue his service. Health complications and PTSD led Edwin to begin abusing drugs, and eventually resulted in his homelessness. Edwin was placed in supportive housing in the Bronx, where he met Derek, a veteran peer specialist who served in Korea. Understanding Edwin’s struggle, Derek recommended that he join Battle Buddy Bridge®, an innovative program developed by Volunteers of America that certifies veterans to become peer specialists and trains them to better understand their mental health diagnoses. Together, the pair completed the week-long training, administered by Sharmin Prince, Director of Veterans Programs at VOA-GNY. 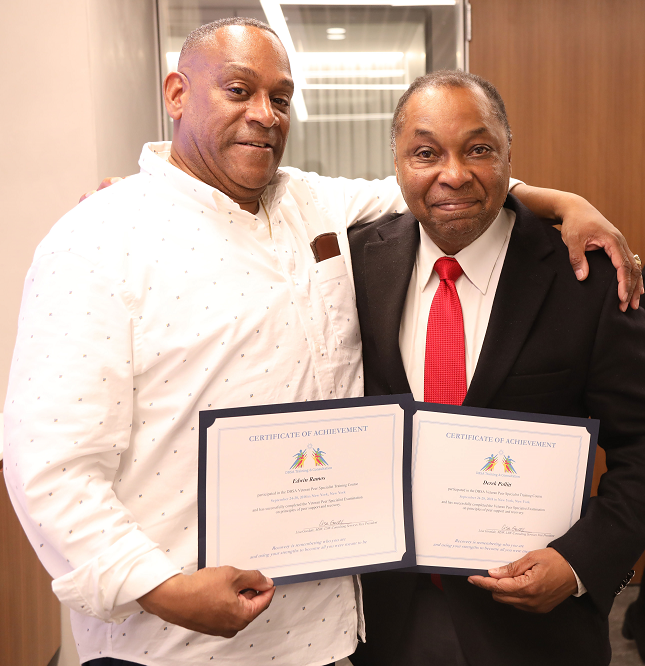 Three days before Veterans Day, Derek and Edwin proudly graduated the Battle Buddy Bridge® program together, equipped with the tools to aid both themselves and others in their reintegration journeys.